Tokyo 2017: Daihatsu Multisix, new Avanza previewed? Home » Cars » Tokyo 2017: Daihatsu Multisix, new Avanza previewed? Daihatsu’s 2017 Tokyo Motor Show concepts are divided into two camps – one geared towards its home market of Japan and the other for its main overseas markets, which are Indonesia and Malaysia, the latter via Perodua of course. The Daihatsu DN Multisix is in the latter camp, and was first seen at the 2017 Gaikindo Indonesia International Auto Show in August. The multi purpose vehicle is of course the dominating bodystyle in populous Indonesia. Daihatsu and Toyota are leaders of the three-row MPV market there, with the Toyota Calya and Daihatsu Sigra entry-level duo and the Toyota Avanza and Daihatsu Xenia mid-size twins. 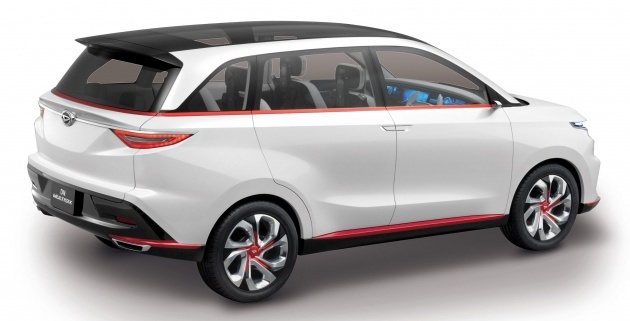 The Daihatsu DN Multisix concept raises a possibility of a larger, range-topping MPV offering more space and comfort. It could also be a preview of the next Avanza/Xenia, which are long in the tooth and have been outclassed by newer rivals, product wise. In terms of dimensions, the 1.5L show car is 4,310 mm long, 1,720 mm wide and 1,695 mm tall, with a wheelbase of 2,620 mm and a high 250 mm ground clearance. That’s longer and wider than the Avanza’s 4,190 mm and 1,660 mm measurements. The Multisix name references the concept’s number of seats, which is six and not seven. As a nation and the income of its people makes progress, so does the population’s expectations when it comes to transport. The Toyota Innova’s flagship six-seater variant mirrors this, which means that Toyota and Daihatsu are on the ball. The Multisix also has some SUV flavour in its design, which is of course the trend now. Speaking of design, the Multisix at Tokyo Big Sight has an unchanged exterior from the one in Indonesia, except for trim colours – red accents here instead of gold. Like what you see? When Honda, Toyota, P1 & P2 is selling well, our Govt is more Happi. Now everyone is Happi. Are U Happi now ??! ehh nice lah! put in myvi side mirror and perodua batch, tadaaaa! new nautica or kembara already! that interior shot is from the dn trec concept, not the multisix. notice the dn trec name on the sills. This Multisix has dimensions in the same class as P2 Alza. Both running on 1.5L engine. Would it be possible Alza replacement? hey perodua dihatsut or what not. 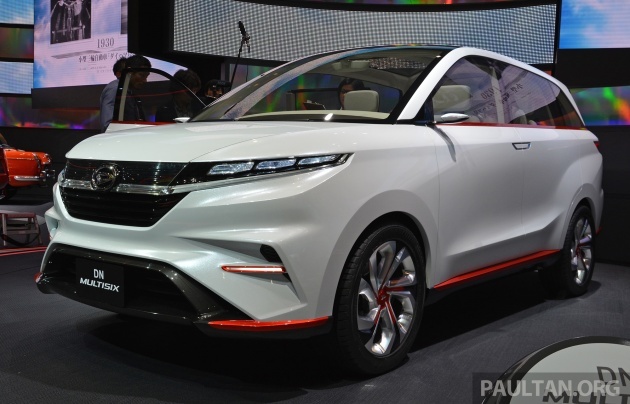 people dont want sporty looking mpv..
look like chinese design style ? !